And what I mean is, I can’t bear to continue buying contaminated, unhealthy meat from horrifically inhumanely raised and slaughtered animals. And going vegetarian is not an option for me – I believe, absolutely, that a strict vegetarian/vegan diet is not the most healthy option. And I’m not ashamed to admit that I love the taste of meat. I used to think I could never slaughter animals myself, but it turns out that most of that fear was a fear of not doing it right, of screwing it up and causing the animals distress or pain. But with every animal I’ve killed, I’ve gotten more and more confident. I truly believe that the last two roosters I killed knew absolutely nothing was happening: one moment they were alive, the next moment, they were dead. I would love to be in a place where I could raise larger animals like cows and pigs, but until that happens, I’m stuck in the city where “hooved animals” are not allowed. (Strangely enough, all other animals are fine…as long as they aren’t too noisy or stinky. Perhaps I should get ostriches??? 😉 ) These regulations mean I can have chickens, and I can have rabbits. This year, I’m getting 8 – 10 Naked Neck chicks to raise up. They are a heritage breed, bred for flavor rather than unnaturally fast growth. These birds won’t keel over of heart attacks at a few weeks old, or shatter their legs when they try to walk, as the industry Cornish Cross breed does. If it goes well, I’m think of adding a small breeding trio of Naked Neck adults to my urban farm, so I’m not dependant on (or patronizing) the commercial hatcheries. I’m not technically allowed to have a rooster – but only because roosters crow. If I try keeping a rooster, I’d have to use one of the No Crow Collars. They have mixed reviews, but after reading tons of them, one of the major difficulties seems to be getting them tight enough without choking the bird. And the reason why they can’t get them tight enough, seems to be the problem of shifting neck feathers. Naked Necks don’t have neck feathers. Possibly problem solved? I think it’s worth a try. I can’t find anyone who has written about using a collar on a Naked Neck. Do you know of anyone? They certainly cut out the noise, while still allowing the rooster all other normal sounds and activities. And rabbits, of course, are going to be my other meat animals. Not my mom’s pet rabbits, that I’ve been writing about recently. These will be a breed that is almost exclusively used for meat production: the New Zealand. The adults are not especially cute. They will, however, have an excellent life with me, as I will not raise anything in tiny little wire cages. 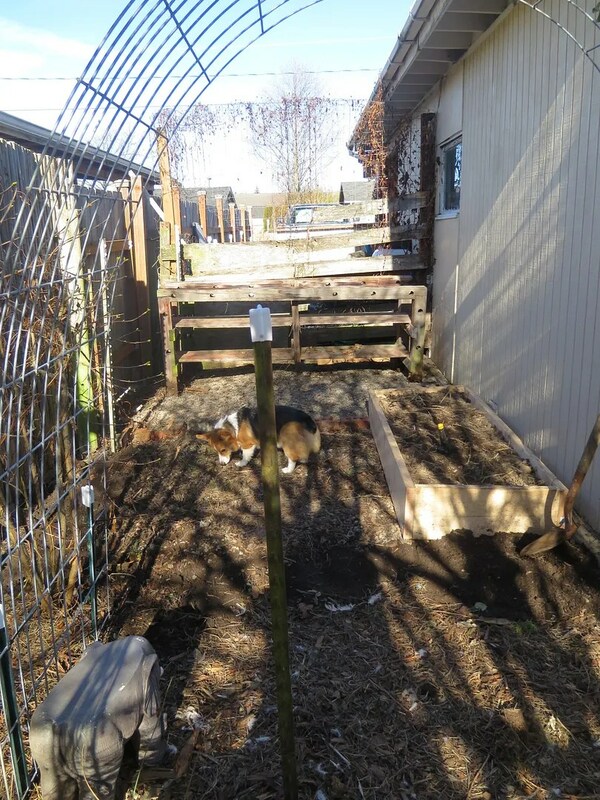 These rabbits will have a large space to run and play in, and lots of fresh food. Although killing animals is not easy (and should not ever be), it is entirely natural and far more moral than supporting the cruel practice of factory farming. It’s incredibly recently that all of us have lost the skill. It’s actually shocking to realize that having a flock of chickens, rabbits, or even a cow in the backyard was absolutely normal within living history. The summer kitchen area (which will also be my meat processing area) is finally cleaned out and ready to build on. (Well – ready except for digging out a few stray t-posts.) As you saw in the last post, I left a horrific mess of rotten fence boards and other junk laying about until I had time to finish it. While I was at my day job, mom came out and cleared almost all of it away for me! 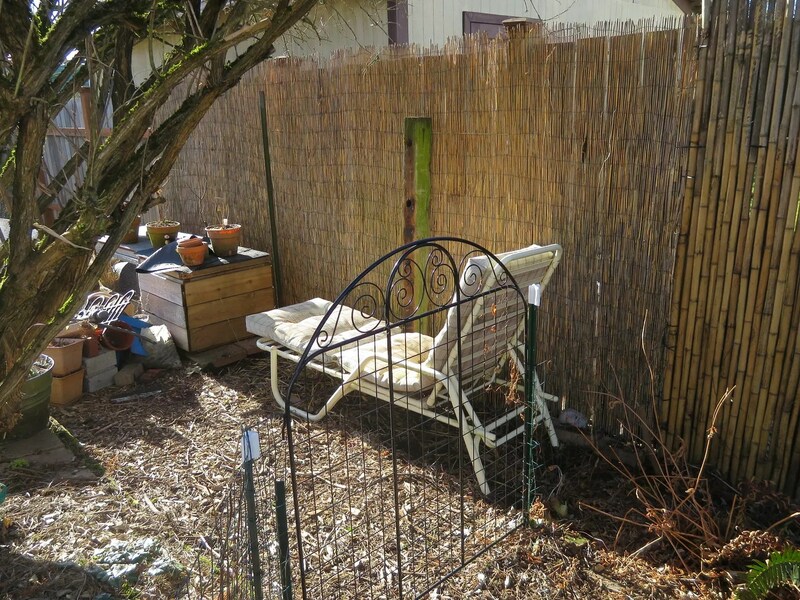 It was an awesome surprise, letting me jump directly to the more fun bits of re-attaching the bamboo privacy fence. It’s starting to look nice now. And the old potting bench fits! It just needs a new counter. And where the potting bench used to be, is now prime seating area. It’s really warm and sunny in winter (Ellie the chicken and I sunbathed together there just yesterday) and in summer, it’s cool and shady. I’m going to build an awesome arbor here, with fluffy cushions, and fairy lights. Stay tuned. This entry was posted in chickens, rabbits and tagged naked neck chickens, new zealand rabbits, no crow collar, raising meat animals. Bookmark the permalink.